How to Make Paper Beads. Today we will make beads out of paper. Once you finish making the paper beads, you can string them together to create unique necklaces, bracelets, earrings, & pendants! Paper beads are fun to create and make amazing gifts for family and friends! I have even made paper beads with kids in my classroom. Many of my 4 and 5 year old students were able to roll them up and make them with a little help from the teacher! Younger students can help choose pictures and cut strips. They may need some help rolling the beads up. Either way, it’s a great fine motor skill to practice! 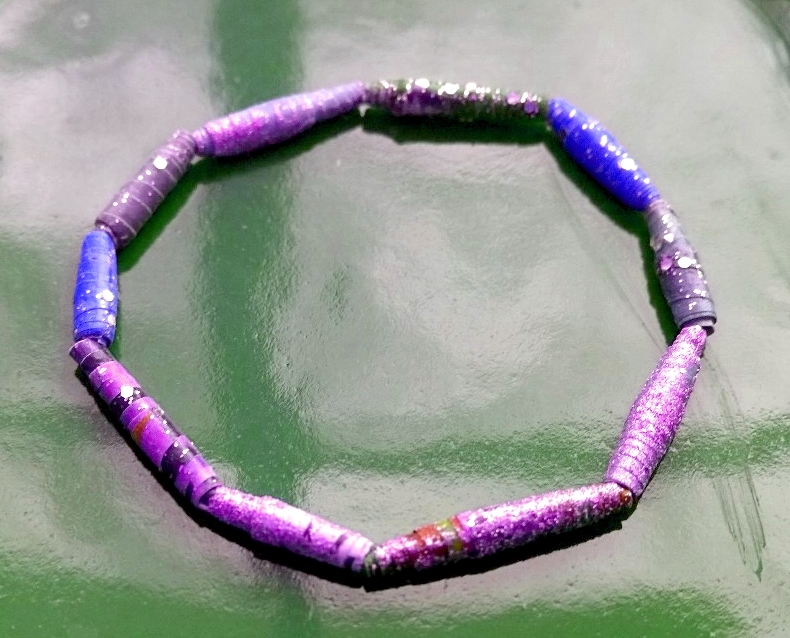 Making Paper beads can be environmentally friendly too, when you use recycled paper or magazines that might otherwise be thrown away to create your own jewelry. Choose bright and colorful paper if you want your beads to be bold and bright. You can also use bright and colorful images from magazines to make vivid and eye-catching beads, or make some really neat black and white beads by using the text and written parts of the magazine. I prefer to use magazines to make the paper beads because the paper from the magazine pages is thin and is easy to form the beads with. Another reason to use magazines, particularly fashion magazines, is because you can get some really great trendy colors that will make for some nice looking jewelry. I made these paper beads into a bracelet. I painted the beads with glitter nail polish to give them a little shimmer! To make the beads shown in the picture, cut long thin acute triangles out of your paper or from magazines pages. The width of the strip of paper should be about 1 inch wide or less and the length should be about 3 to 5 inches. The longer you make the triangles, the fatter the beads will be. The wider you make the triangles, the wider your beads will be. If you want all of the paper beads to be the same size, you need to cut paper triangles that are all the same size. When I made my beads, I didn’t worry so much about making my beads all the same, so I did not measure the paper before cutting. My beads turned out just fine this way, some were just a little bit longer or fatter. 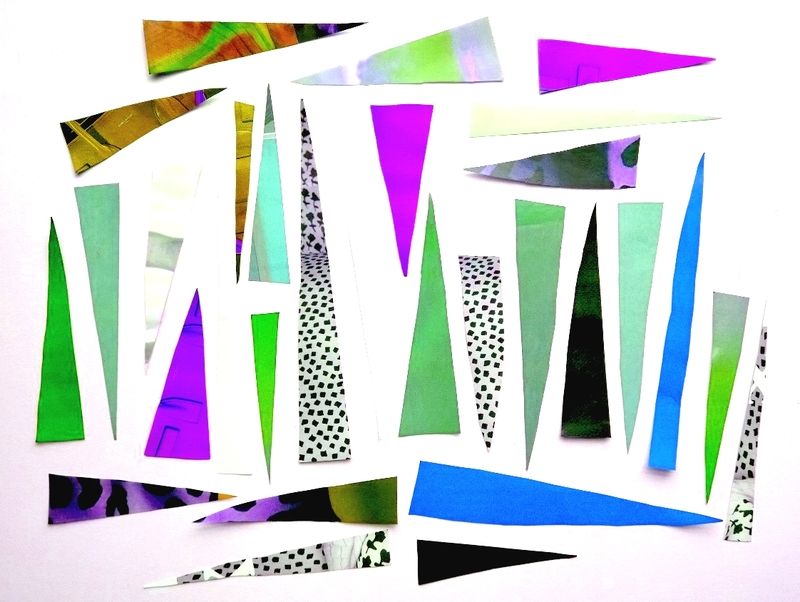 Long thin paper triangles cut from colorful magazine images. After you cut out the triangles, arrange them by color. Take one of the paper triangles and paint on a thin layer of varnish or watered down school glue onto it. Roll it up tightly around a nail or round metal skewer to create a hole in the middle, starting with the wide bottom end, and rolling it to the top point of the triangle. Smooth the bead over with your fingers and move it back and forth a little so that it doesn’t stick to the nail or skewer. After about 20 seconds the paper will stick together on it’s own and you can take the completed paper bead off the skewer or pencil and place it aside. Repeat with another triangle and continue to make more paper beads until you have what you need. This image shows how to create beads in a variety of shapes. The elastic string I use to string the paper beads into necklaces and bracelets. You can use it for stringing all kinds of tiny beads into jewelry and you get 229 ft of it per roll. It’s on sale too at the moment – you get one roll for $2.29, that’s a steal compared it’s normal price of over $10.00! You can alternate the paper beads with some glass or wooden beads, or make your piece entirely out of paper beads. Finally, tie up the ends of your beautiful new bracelet or necklace. If you are making earrings, you might only use one or two magazine beads on each piece and you could add a pretty crystal or other bead to complement the paper bead. When creating beads with children, some kids will be able to cut out the triangles and create the beads all on their own. Some will need an adult to cut the triangles for them, but will be able to do the rolling and gluing part. Some will need even more support, it just depends on the kid. What a great way to give your little ones practice with their fine motor skills and the finished product makes a beautiful gift for friends and family! I love how colorful they turn out and each bead is so beautiful and unique! This is a fun, open-ended, hands-on activity where children make patterns with beads on a pipe cleaner. Here are my lesson plans. Procedure: Read Book: The Legend of the Candy Cane. Review AB pattern. Model what it looks like to create an ABC pattern on the whiteboard. Today we will be using ABC patterns to make a candy cane ornament. Review the colors. Model what it looks like to make an ABC pattern with the beads. Then bend the pipe cleaner so it looks like a candy cane. Students work at tables to create their candy cane ornaments. Assessment: The standards will have been met when students are able to use the beads to create an ABC pattern that repeats at least 3 times. Extension: Students create a more complicated pattern, such as an AAB pattern or ABCD pattern. For this easy snowflake craft, you will use an eye dropper and salt to create a pretty tie dye effect! We had so much fun making these in our kindergarten class. Thanks, Cindy Bergeron for this awesome idea! 1. Start by placing 3 pieces of painters tape onto the watercolor paper in a 6 pointed star asterisk shape. 2. Add 2 short pieces of tape to the end of each point on the asterisk, use the picture as a guide. 3. Have kids paint the whole piece of paper with water. The paper should be pretty wet. 4. Use eyedroppers to suction up different colors of watered down paint and drop onto the paper until the colors blend together as desired. 5. Sprinkle a little salt over the picture. 7. Remove the tape, attach to a blue pice of construction paper, and hang up your beautiful snowflake! 1. Use music and songs while you are teaching, and kids will retain information for a lifetime! Youtube is an awesome resource for songs and videos for kids. Check out this post where I have a list of my favorite music videos all in one place. Songs To Sing In The Car – Resources for music lessons and activities parents can do with their kids! Music Activities for Smartboard – The title explains itself, a site with lots of SmartBoard music activities to use in the classroom. TLC Music for Kids – Music activities brought to you from The Learning Channel. ChildrensMusic.Org – A non-profit music resource for parents, teachers, and kids. Disney Music Activities Play music games and more on Disney’s Music site! Music Tech Teacher – Music quizzes, games and worksheets. CreatingMusic.com The goal of this web site is to provide an environment for children to experience creative play in the creation of music, with the same ease they have been able to enjoy with toys, drawing tools, building blocks, puppets, etc. BSO Kids Kids compose their own music, play online games and print coloring pages of their favorite instruments. Flash Music Games Create your own simple musical compositions or play a drumkit with your keyboard. The San Fransisco Symphony Kids Site Play music games or compose your own tune! 3. Bring a piano or keyboard into your classroom. When students explore the piano they begin to establish a foundation of musical understanding. You can often find a free unwanted piano sitting around the school somewhere if you just ask around. I’ve found a couple like this. You can also check the free section of craigslist but beware of trying to move it! A Nice Simple Keyboard with Piano, Horns, and Other Sound Options. – I use this for simple music composition. Google Moog, a synthesizer that you can play and record on. Click on the image to the left or click here here to open a new window and play. Virtual Drumkit Play the drums using the keys on your computer’s keyboard. Web Drum Machine Another cool web application where you can play a drum machine online. This would be another fun Smart Board activity! 5. Incorporate music related crafts into your day. Speaking of music related crafting, you can make your own instruments out of found and up-cycled materials. Make your own guitar for your kiddos to experiment and play with or a drum to bang on. Here are 6 Musical Instruments You Can Make. Here is another site with 10 more ideas for making musical instrument crafts. *These activities are intended to be used with kids in prek and kindergarten, but can be adjusted to work with younger and older children. Did You Know? Studies have shown that students become more engaged in activities when they are given multiple opportunities to participate in musical and creative expression throughout the day! I hope you have enjoyed this post! Find these and many more music and movement activities pinned to my Music and Movement Pinterest Board! Have a music activity for PreK or K you want to share? Leave a comment below with your ideas!